process to a depth of .002 in. with a surface buildup of .0002 in. I read that as the surface treat affects the outer 2 thou of the original valve material and this increases the size by 2 tens of a thou. Not as an increase of 2 thou on size or that the added material is 2 thou thick, just that it is mixed into the original material outer layer of 2 thou. Statements such as these are always open to different interpretations depending on the reader. It says the process changes the microstructure to a depth of 0.002" and while doing this it causes the valve to grow 0.0002"
So 0.002" is the limit of the changes caused by the diffusion of what ever they are forcing into the steel.. Some of the C or N might actually diffuse deeper , but there will be insufficient at a depth greater than 0.002" to make a measurabe or observable difference to the microstructure . A lot of heat treatments cause it item to grow. This is either due to atoms occupying intertstitial spaces thus stretching the lattice a little . The lump sum of these little stretches is overall growth of the item. The other factor that comes into play is different sizes of different phases . Bainite, Martensite & cementite all have different densities so if you change the propertions of them in the steel even without changing the chemical composition then the object will either grow or shrink. This is why the nitrogen processes were such a significant advancement in heat treating as all of the nitriding only process are dimensionally stable thus you can make the part to finished dimensions then nitride & it comes out the exact same size it went in & if done in a controlled gas furnace, comes out bright so requires no surface cleaning. Carbo nitriding can cause dimensional increases ( sounds better than growth ). This stuff is leaping forward as manufacturers seek more energy efficient ( cheaper ) methods of microstructure manipulation and furncase controls are getting far more precise so you can do "furnace quenching" to very closely control the cooling rates. Last edited by BSA_WM20; 11/03/18 6:47 am. Hard to tell how much was being used because the drivers rarely checked so most times Tony or I checked the reseviours they were generally empty. However the vans running LPG systems that did not require to start on petrol & not fitted with the Flash Lube would burn a valve bad enough for the van not to start in around 2-3 years. The vans running Flash Lube never burned a valve despite the fact that they were regulary dry when checked. on valve recession,reading on this thread i feel that the information has been thought through before submitted. do, PS in am using lead free race fuel but still can purchase leaded race fuel hear for off road use only. It is all well and good to take research papers more seriously than gossip, but real world experience reported should be given some weight. I always cringe when someone tries to distinguish between "research" and "real world." It's not as if "research" is conducted in a vacuum that is disconnected from the "real world." Researchers use "real world" information to inform the controlled experiments they conduct to try to eliminate as many uncontrolled variables as possible to get at the root causes of phenomena. 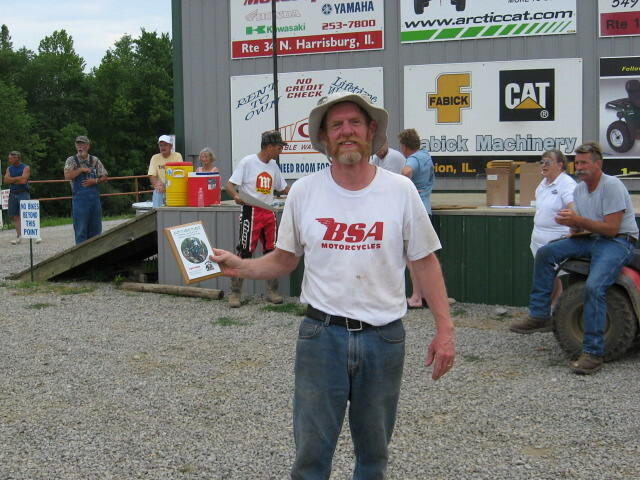 As for giving weight to "real world experiences," in the specific case of this thread I quoted the findings of controlled "research" experiments in several papers that identified the mechanisms for valve seat recession and then showed how these findings were consistent with the anecdotal information Hillbilly had collected from uncontrolled "real world" experiences. His anecdotal information indicated that seats receded in some situation but not others, but uncontrolled variables in the "real world" include rpm, operating temperature, oil additives, octane, seat material, seat hardness, valve material, drivers' behavior, etc. "Research" eliminated those variables to determine the root cause(s) of the recession that isn't consistently observed in the "real world." Crucial to accepting any report is to know who financed it. No info these days is truly impartial. Vested interests distort data. I'm a lot less conspiratorial about this than you are. Speaking as one who has published plenty of data, and who knows quite well many hundreds of other people who have published plenty of data, I completely reject your blanket statement that "no info these days is truly impartial." First, welcome to Britbike. In reading your post you mention 'valve recession' several times but never mention 'valve seat recession." To be clear, are you talking about recession of the inlet seats, or erosion of the valve faces (or, perhaps, "tulipping" of the heads or stretching of the stems)? If it's the seats that were receding, what material are they made from? You mentioned you tried both Ti and stainless valves, but normally they use different seat materials. how will actually having the materials "in hand" help you to choose the material you will use for the guides? FedEx just dropped off the 6' bar of 1"-dia. Ni-Resist cast iron, bringing me one step closer to having the potential guide materials in hand. Last edited by Magnetoman; 11/03/18 7:08 pm. Reason: p.s. PS the stainless valve was for exhaust only as i have no experience with titanium in that kind of heat. Last edited by trevor's; 11/05/18 2:28 pm. I can understand the valves tullipping when low spring pressure allows the valves to float at high rpm. I also think that to much valve spring pressure could hammer the seat when the valve is slamming shut for hours on end when riding on Cannonball. The extremely loose valve guide also allowed the valve to bounce and move in ways it was never intended to move causing the valve to hit harder in a smaller area. I still would solve the valve guide wearing problem before replacing seat but then again I would I would repair the head as is. One experiment is worth ten theories. A close up of the valve face could be quite helpful. Hmm, even though I plan to sign up for the next 3000-mile ride on the Ariel immediately after pigs fly, it could be quite a while before it accumulates a significant number of miles. Given that, plus the fact pulling the head takes less than an hour, means I could just replace the guide and recut the current seat now and see how that works out (assuming there's no issue recutting it, which I won't know for a few days). If another problem arises with the current seat it only would have wasted a couple of hours if I waited to install a new seat until later. It's certainly worth considering. The pigs are already flying around here. Just seen a plane fly over here. On the side it said "Swine Airways". If a new seat is fitted then the depth of the recess and the thickness of the insert should be so that the seat is someways proud of the combustion chamber. Well it's not the best answer but: if you do decide to ride 3,000 miles (for any reason) pre-cut a few repair parts and pop them in during stops. if you do decide to ride 3,000 miles (for any reason) pre-cut a few repair parts and pop them in during stops. I thought I was over-prepared for the Cannonball but if hell froze over under the flying pigs and I were to do another 3000 miles on the Ariel I would have spare guides, springs, and a lot more "superfluous" spares with me. Am I the only one who will confess I'd rather read your reports while comfortably sipping my morning coffee than spend eight hours every day in the barely sprung saddle of a rigid-frame bike trying by sheer willpower to nurse it to the next stop? And then wake up the next morning and do it all over again. And again. And then 2 years later that same person was riding the 2018 Cannonball. I couldn't agree more with that unnamed someone, now, or two years ago when he wrote it. "All life is an experiment. The more experiments you make, the better," rationalizing his change-of-mind with “A foolish consistency is the hobgoblin of little minds, ..."
You thought you were over prepared for the Cannonball? Excessively involved with machinery, yes. Otherwise ready? No. Not enough mileage to effectively debug the beast. Not enough mileage to become one with it. Learning it's subtleties and nuances after the start is not a good recipe for happiness. Learning during the event that so called 'improvements' create their own odd little issues is unhelpful. Exotic gear box grease? Fancy magneto timing doover? Non factory top oil ring? Sorry to rant on. Like everyone else I'm really on your side but I get a bit glazed about the eyeballs when people try to 'improve' machinery when they haven't thoroughly explored and understood it's abilities beforehand. Anyway, we all know you're going to enter again even if you haven't admitted it to yourself yet, so next time remember it's a long distance RIDING event and plan accordingly. I'm looking forward to the continuing adventures of Magneto Man. Not enough mileage to effectively debug the beast. Not enough mileage to become one with it. Another 2000 break-in miles would have been revealed the valve guide issue so I could have dealt with it then, not now, but that would have required me to finish rebuilding it a lot sooner. As the famous motorcyclist Donald Rumsfeld once said, you go to the Cannonball with the Ariel you have, not the Ariel you might want or wish to have at a later time. He certainly hadn't anticipated all the bugs in his approach, either. Actually, it's looking like the timing of an Australian motorcycle Grand Adventure may well interfere with the 2020 Cannonball anyway. Details TBA in due time. Thanks very much. Me too. Didn't that same 'cyclist talk about unknown things that we know we don't know? Further showing his wise understanding of motorcycles, when I first got my Ariel he told me "I can't tell you if your Ariel rebuild would last five days, or five weeks, or five months, but it certainly isn't going to last any longer than that." A year later he sagely pointed out that "It is easier to get into something than to get out of it." When I had misplaced a few things during the rebuild he helpfully told me exactly where to look for them: "We know where your missing tools are. They're in the area around your garage and east, west, south, and north somewhat." As can be seen, the usefulness of Donald Rumsfeld's motorcycle advice wouldn't be out of place on Britbike, not the least of which is his observation that "There are things we do not know we don't know." On the subject of famous motorcyclists, Joseph Heller wrote about the BSA 6-spring clutch: "But come to us with a clutch complaint and you can fool us for weeks. The clutch, you see, is a large ugly mystery to us. ... We're pretty sure today that the clutch exists and we have a fairly good idea of what it does whenever it's doing what it's supposed to be doing. Beyond that, we're really in the dark." Joseph would have told you that you know everything about your 1928 Ariel except how to enjoy it. Au contraire. When I was only 15 I bought my first motorcycle because Kurt Vonnegut explained that “I tell you, we are here on Earth to fart around, and don't let anybody tell you different.” If what he said weren't true, motorcycles never would have been invented. Haven't read any Vonnegut since I was 15. Maybe time for a revisit. The replacement G&S valve, Kibblewhite valve blank and bronze guide blank aren't here yet so I'm still considering my options for how to proceed once everything is in hand. As part of that I mounted the head in the jig I made for it, and then used a valve guide level on an 11/32" pilot to adjust the tilting table to make the seat parallel with the table (~37o). The head still has the worn guide in it so this setting isn't perfect but it is more than good enough for present purposes. With the seat now parallel to the table I installed a narrow tip on a dial indicator, zeroed it on the outer edge of the recessed seat, and then with the tip retracted moved the table to have the tip on the only-slightly-recessed edge next to it. As can be seen the seat is recessed by ~1/8". 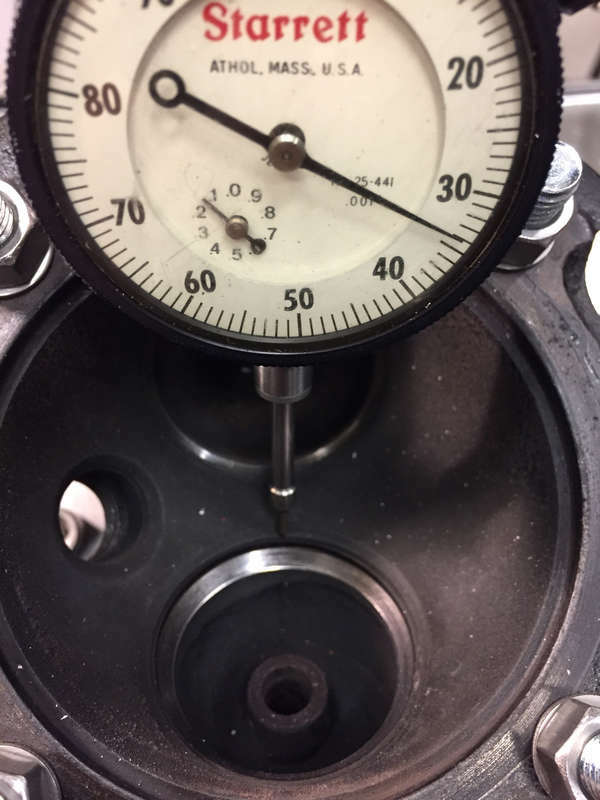 To retain the same valve geometry as stock the valve stem would have to be ~1/8" longer which would be easy enough to accomplish by machining the stem of the Kibblewhite blank to be ~1/8" longer than stock. If, instead, I install a new seat, I could either use the new stock G&S valve (not here as yet from the AOMCC[*]) or machine the Kibblewhite blank to the stock dimension. [*] The G&S valve arrived in the afternoon mail so I'm one step closer to dealing with the head. Yet another alternative I think I mentioned in an earlier post is I could add 1/8" of Stellite 6 to a lash cap to extend the height of this stock valve. The new G&S exhaust valve arrived yesterday from the AOMCC. Compelled by curiosity I measured the roughness of the stem. Surprisingly, it's a rather high 20 µ". It will be interesting to compare this to that of the Kibblewhite's stem when that valve arrives. For reference, Sunnen claims their coarse 150 grit stones give 20 µ" on hard steel, with the 400 grit they recommend for "fine finishing" giving 5 µ". 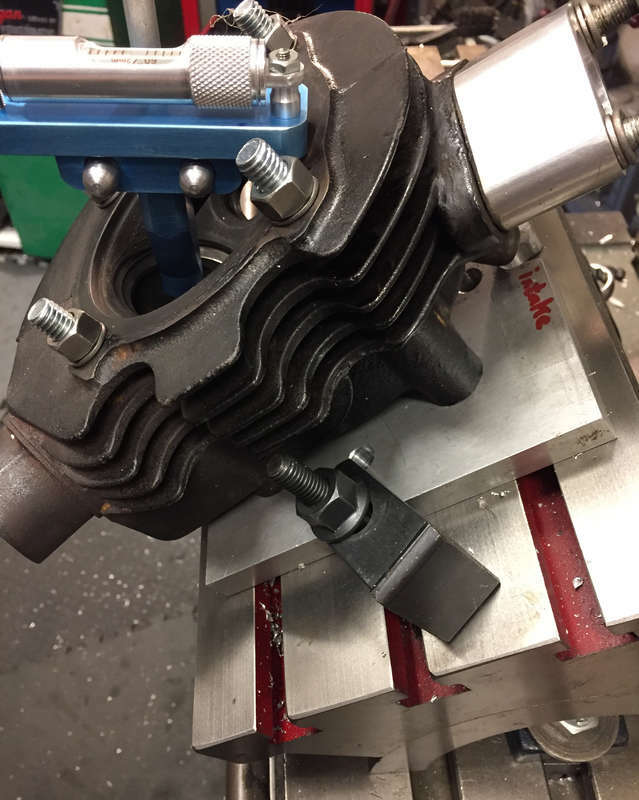 I also measured the stems of the old intake and exhaust valves and found 19-20 µ" for both so 3000 miles worth operation inside G2 cast iron didn't have an effect. 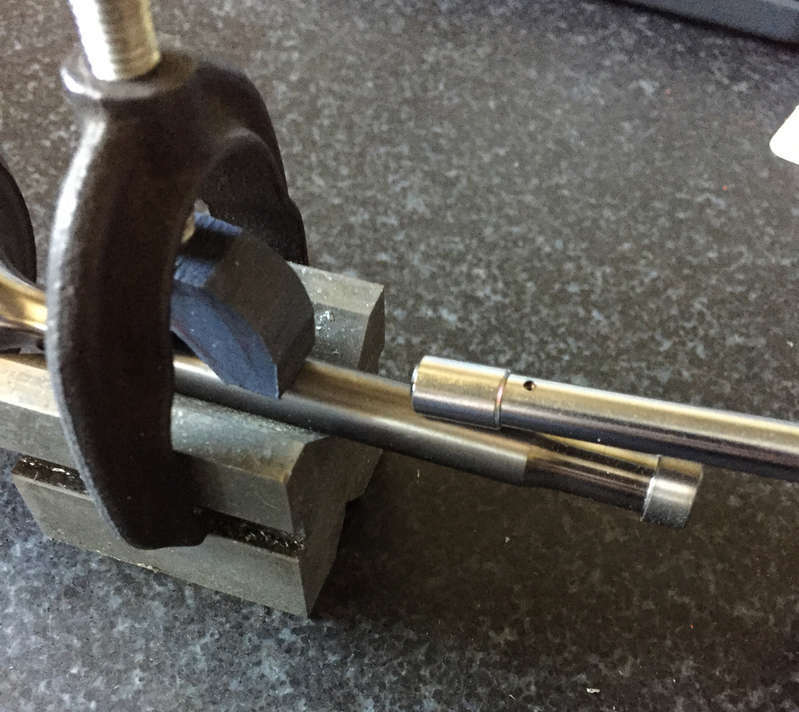 Remember, the inlet guide showed no measurable wear at the level of 0.0001" so it appears this seemingly-high roughness isn't an issue for causing wear, although the worst looking portion of the lower part of the exhaust valve that enters ~1/3 of the way into the guide during operation was much higher at 47 µ". Today I happened to notice the exhaust valve rocked back and forth a little when it was sitting on the surface plate. The inlet valve didn't rock. 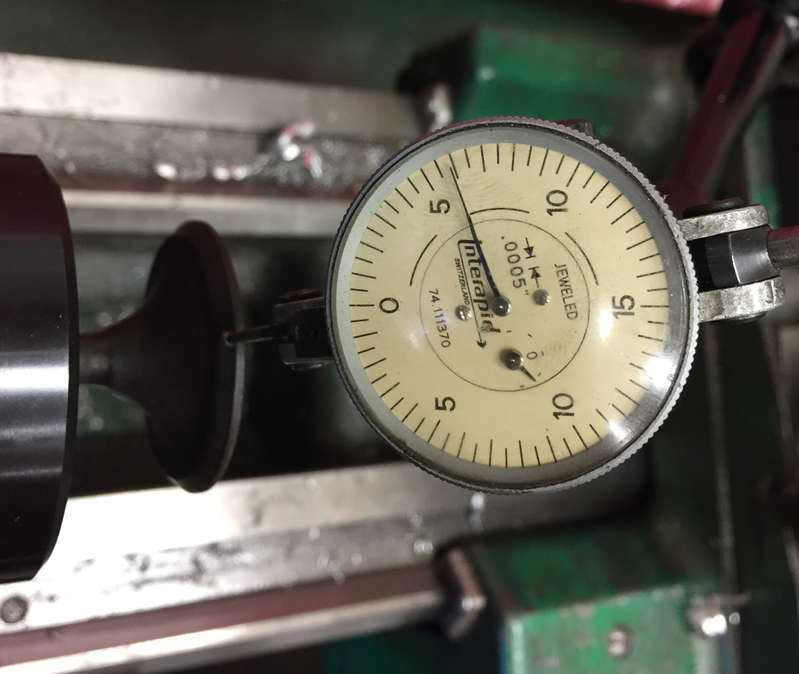 I measured the rocking to be ~0.014" at the top of the 4" stem, however this could have been due to uneven buildup of carbon on the face so I then put it in a collet in the lathe and found the wobble to be ~0.006" at the sealing face of the 1.75"-dia. head. 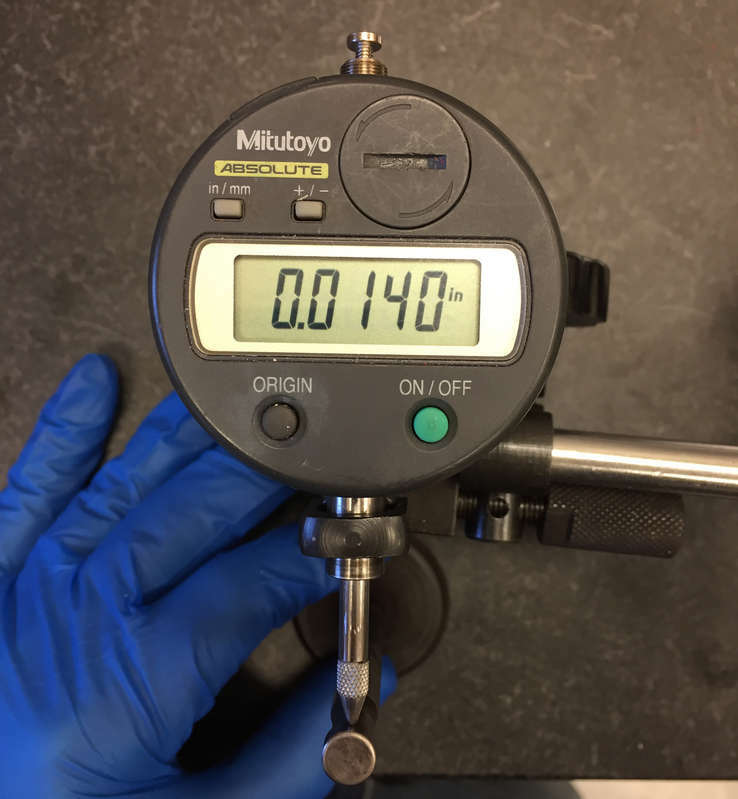 Since 4"/1.75"x0.006"= ~0.014" these values are consistent and show that the head of this valve is bent significantly with respect to its stem. In contrast, neither the old inlet valve nor the new exhaust valve rock on the surface plate or wobble in the lathe. Even after replacing the guide at 2000 miles the compression wasn't right. That is, I could push the engine past TDC without using the compression release. Although this doesn't explain how the valve got bent, the fact it managed to get bent explains the low compression. With enough wear of a guide it's possible that despite ~0.006" of bend with respect to the stem it could manage to seal (at least, in one orientation of the valve), but after replacing the guide the bend would have made sealing impossible. If nothing else, the Ariel has served as a rolling research laboratory. I take it you didn't have time to lap the valve after replacing the guide on the Canonball, because you would have noticed the bent valve then, or do you think the valve got bent later?